Age of Spartans will offer you a game that is inspired by the brave warriors from Ancient Sparta, the ones that fought against a huge Persian army at Thermopylae. The 300 Spartans that died there, giving the rest of the Greek armies a chance to unite, were celebrated in multiple movies and slot machines released in the last decade or so. The movie “300” seems to have been the trigger for the popularity of the Spartan warriors. Saucify (formerly known as BetOnSoft) is the developer behind this game. Though with 5 reels, Age of Spartans has a relatively low number of lines, 9 being available. 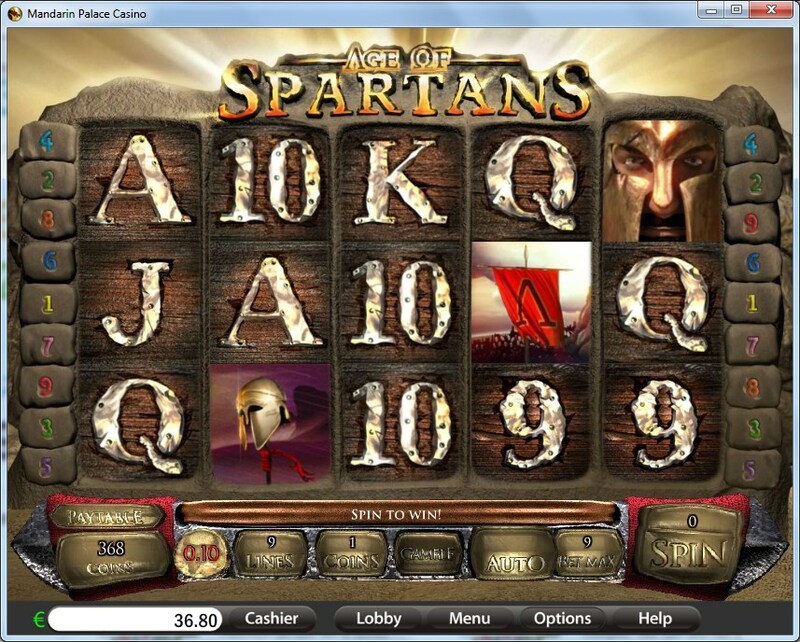 Scatter symbols, wilds, free spins and multipliers are all part of the offer. A jackpot of $12,500 can be won. 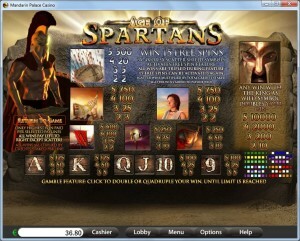 Give Age of Spartans a try, and on its reels you will find that there are wild symbols present, multipliers, scatters and free spins. The King symbol, which only shows you a close-up of his head and helmet, is used by the game in the wild feature role. Because of that, it is more than capable of giving away its own prizes, while at the same time acting as a substitute on other paylines. Combinations of two to five wilds form on active lines, when these symbols arrange themselves from the left to the right. Payouts reach values of up to 10,000x when wilds do this. As substitutes, the wild King icons have the power to double wins they take part in. The Shield, which you might not immediately recognize since it has a couple of dozen arrows stuck in it, is the one that gets to appear scattered on the five reels. With just two, you will be able to get a prize from it, but the maximum of 500x the bet is given for all five Shields. Those that get a minimum of three scattered Shield icons, will find that they receive both the prize I mentioned, and a round of 15 free spins. 3x multipliers are used on all wins obtained during the free spins. If you re-activate the feature, with another 3+ Shields, you get an extra 15 free games. The game is cheap enough to play, and it asks you to choose the number of active lines (1 to 9), the number of coins per line (1 to 5) and the denomination of those coins ($0.01 to $0.25). You can spend $1.25 for each line, and up to $11.25 for all 9. The game has top payouts of 10,000x to give away, meaning up to 50,000 coins, or $12,500 cash. The design of Age of Spartans uses a lot of stone in the construction of the reels. The symbols look like room for them was made by sculpting in stone, and the same material is used all around the game area. There are even stones that are used to support the payline numbers. You don’t get to see much of the battlefield unfortunately. The symbols look pleasant enough if they’re themed, but boring if they’re poker cards. Symbols: King (wild, 10,000x), Shield (scatter, 500x the bet), Horn (750x), Queen (750x), Flag (400x), Helmet (250x), Sword (250x), Ace (125x), King (125x), Queen (100x), Jack (100x), 10 (100x) and 9 (100x). 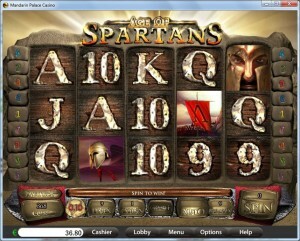 It’s not the only Spartan themed slot machine you can find these days, so there are better options available out there. If you’re looking just at the slots from BetOnSoft, then yes, it’s worth playing. 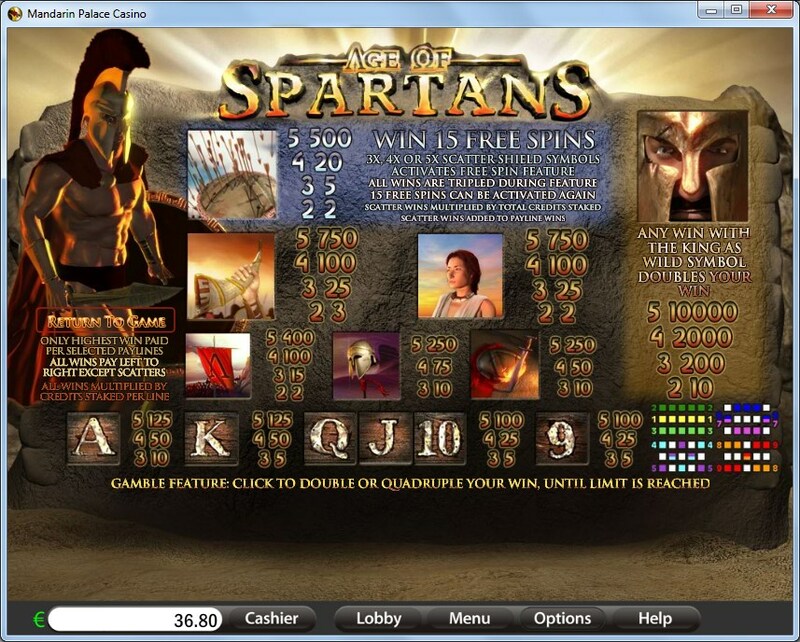 You will find Age Of Spartans at any online casino which chooses to use software from Saucify/BetOnSoft , playable either for free or for real money.